Sunlight hote hotel is located by which is famous beauty spot recognized as the world's heritage by UNESCO twice. Staying at Sunlight hotel, you can have a view at the picturesque scenery of Halong Bay. 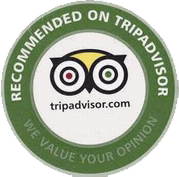 The hotel is a 3 star consisting of 47 rooms with their overall view over Ha Long bay. With standard guest rooms, luxurious guest rooms, including suites, you are sure to find a variety of rooms to fit your needs. 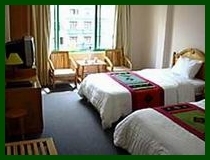 The hotel offers the various facilities with the standard amenities of the hotel in its class. In addition, the nice interior decoration also make the place a perfect choice to spend your holiday or serve your business purpose. 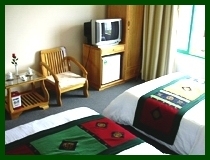 Either you come here for business purpose or sightseeing, you can relax in this comfortable hotel. Visitors to Halong will see that the hotel is the right choice with its convenient location and complete service and facilities. 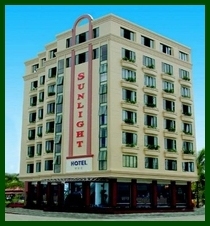 Sunlight Hotel has 58 guest rooms including Suite and Deluxe. All are well designed and finished to provide guests with elegant and luxurious ambiance. Each room is equipped with all of the amenities and comfort to make your stay as pleasurable as possible. Whether you are visiting for business or pleasure, the hotel sure you will find accomodations more than satisfying. Superior Rooms are 33 sqm located on the 2nd - 5th floors. Rooms have city views. They are fitted with a double bed or 2 single beds. Bathrooms have a bathtub with an overhead shower. All room equipped with all comforts to ensure you a relaxation and pleasant stay. Deluxe Rooms are 39 sqm located on the 6th floor. They have sea views and are fitted with a double bed or 2 single beds. Bathrooms have a bathtub with an overhead shower. The rooms are large in size and well equipped with sanitaly fitting to ensure you a pleasant stay. Sunlight Suite Rooms are 70 sqm located on the 7th floor. They have a private sea view balcony and living area. They are fitted with a queen size bed. Bathrooms have a bathtub with an overhead shower. All rooms are large and eqquipped with all comforts to provide you with complete relaxation for your stay pleasure.